There are literally hundreds of thousands of locally produced products in Europe that are unique to a country, region, town or even a village. These products rely on their authenticity as a sign of quality, when we know without a doubt that a product was produced from an authentic source we know the quality is guaranteed. How can these unique products, sometimes community or family produced, verify their authenticity? Blockchain technology has already been deployed by food companies in their supply chains, in August 2017, ten of the world’s biggest CPG and food companies partnered with IBM to integrate blockchain into their supply chains. This cohort — Walmart, Nestle, Unilever, McCormick, Tyson, Kroger, McLane, Driscoll’s, Dole, and Golden State Foods — represents more than half a trillion dollars in aggregate annual global sales[i]. However, smaller producers should also be able to benefit from blockchain’s ability to store and share information across a network of users in an open virtual space. For the purposes of this research we are going to concentrate on Spain’s jamón ibérico, or Iberian ham. Iberian ham comes in many forms, but to be defined as jamón ibérico de bellota (acorn-fed Iberian ham) it must first come from Iberian blackfoot pigs, or from 50% crossbreeds. These pigs must then spend several months of the year roaming the dehesa, a pasture planted with oaks, feeding on grass and acorns. During the last few months before being slaughtered they must live exclusively on this diet. Only 6% of total production comes from 100% pure black Iberian pigs raised on dehesas and these are concentrated in two very specific parts of Spain: Andalucía and Extremadura. Nine out of every 10 black labels come from these two regions. As if all the labeling were not confusing enough, there are now question marks regarding the purity of the animals themselves. There are 435,000 registered specimens with the Spanish Association of Iberian Pig Breeders (Aeceriber). Around 341,000 of these were incorporated following a 2014 government decree giving breeders two years to register all genetically pure animals. But instead of demanding expensive DNA tests (costing at least €20 a head), the decree authorized the registration with nothing more than a visual inspection by an expert veterinarian. This is big business. 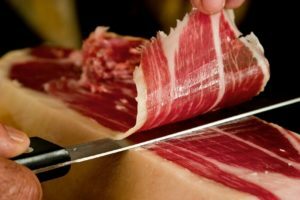 According to the statistics published by the Chinese Customs Administration, in 2017 the sales of pork products from Spain to China suffered a reduction, dropping by 7.1% in terms of volume and by 11.5% in terms of value with respect to 2016, the total figures being 372,985 tonnes with a value of $648.6 million (€574.2 million). The main reason was the rise in production in China and a drop in prices after an exceptional 2016 in which all Chinese pork imports (from all origins) reached the record figure of 3,132 million kilos. 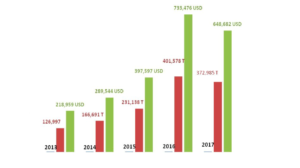 Nevertheless, the Spanish exports were less affected than those from all origins as a whole, because the total pork imports in China fell by 17% in terms of volume and by 23% in terms of value with respect to the previous year. Therefore, Spain had a better market share in 2017 and reached the first place as meat supplier, beating Germany, Canada and the USA. The Chinese are learning breeding production methods fast. Figure 1Evolution of the sales of pork products from Spain to China in terms of volume and value. At present The European Commission guarantees the tradition, health and quality of each ham, covered by Protected Designation of Origin certificates that deem the product has been produced according to traditional methods and within a defined geographic region and special localisation. The PDO seal also serves to distinguish these fine foods from lower quality imitations and guarantees authenticity. Why not put the PDO on the Ethereum blockchain? Why not approach the breeders and breeder’s associations in Andalucía and Extremadura with an Ethereum blockchain solution regarding their authenticity? There are thousands of examples of artisan products in Spain alone which could benefit from verifying their authenticity; olive oil, Rioja wine, the endless varieties of cheese, fruit, nuts and other food and beverages. And that’s just the gastronomic delights that Spain has to offer, other products include ceramics, linen, leather, marble, musical instruments and more. Verifying the authenticity of locally produced products will be as vital as the protection of our own personal online data in the years to come, without it imposters could drain millions of Euros from rightful owners and have the potential to destroy entire communities. This entry was posted in Uncategorized on April 26, 2018 by Nigel Barron. The final module of the course (and the previous module) complemented, conveniently, much of what was revealed this week at Google I/O 2016 – Smart Homes, Smart Buildings and Smart Cities. The world is changing very quickly. Things will change in the near future as sensors become ubiquitous and the way we plug into them becomes more and more intimate. The sensors are already out there, piggybacking on the back of devices that are already in place. Sensors are getting cheaper, as the cost comes down everything becomes accessible and the ability to innovate will be widespread. At I/O this year, Google displayed its vision for a more ubiquitous and conversational way of interacting with technology. Its Assistant is chattier, answering natural language queries with a more human voice, and it’s found its way into several new Google products: the messenger Allo and the Echo-like speaker Home. Both are areas where other companies have a lead, but Google’s strength in AI gave these services some nice twists, doing things like automatically generating surprisingly specific reactions to photos. But you don’t have to have Google’s resources to able to play in this space, a RasPi or Arduino can get things going and as Profesor Sarma pointed out in his last slide ‘Just do it, thoughtfully. But do something. Why? Because IoT is in your future, and IoT literacy is essential. IoT is very personal to your company. You need to figure out how it will impact your business. His roadmap, beyond the ‘walled gardens’ of NEST, HomeKit and Smart Hub is encouraging and his advice applies to all of us and our organisations. ‘Finally, over time, I think that what’s going to happen is we’re going to go to a three-tier architecture. You have the device, you have the cloud, and you have edge computing, if you need performance. And that’s really my prediction for where this world is going to go. IoT is in the future. Devices you buy will be IoT-enabled. Your homes will be IoT enabled. And it’s going to become a competitive thing. And so what you need is what I call IoT literacy. It’s a way of thinking, which is how do I instrument and take advantage of it because it is happening. Don’t fight it, in fact, try and win it. Just imagine if you had fought the cell phone 10 years ago. If you didn’t use your iPhone, your Android phone, or your Microsoft phone. If you didn’t do text messaging. If you didn’t do scheduling on your phone. If you didn’t use Google Maps or Apple Maps, just imagine, you would have been at a disadvantage. I would use the same thing. I mean if you have a factory that refuses to monitor valves using connectivity, compared to a company that has a factory that does. And if their insurance goes down, you’re at a disadvantage. So it is in your future. I predict it. And don’t fight it. But it is very personal to you. What I mean by that is when we bring the technology in, let’s say a cell phone. The cell phone is very personal to me. I use it in a way that is different from even a close colleague of mine. For example, I may use certain features more than she does. My wife and I use our cell phones subtly differently, but within our family we have a certain pattern. We know how to reach each other. We prefer text to a call. IoT is like that. If your business is your family, you will adapt IoT to your business. Your business probably has an advantage– you do something different and it, gives you an advantage. So IoT has to wrap itself around that, so that you can use IoT to make the thing that makes you different more advantageous. And so you have to figure out how to use it. Now, I’m not saying don’t work with consultants. But if you work with a consultant, work with a consultant who understands the process. The IT part of it will come later. But if you start with the IT, you will put the cart before the horse. The IT will dictate what you should be doing as opposed to the process. So figure out your process and figure out precisely where IoT can help you, then let’s figure out the IT. The next thing I recommend is build a real system and try and use it. I assure you the learnings will be fundamental. And it will give you a very gut-level, visceral IoT literacy that you will need. This entry was posted in Uncategorized on May 23, 2016 by Nigel Barron. Security has been the most complex topic so far in my opinion. Security is a huge challenge and when privacy is added to the complexity its clear they are two very, very important topics in the Internet of Things. Srini Devadas (Professor, MIT Computer Science and Artificial Intelligence Laboratory at Massachusetts Institute of Technology, MS and PhD from the University of California, received the IEEE Computer Society Technical Achievement Award in 2014 for inventing Physical Unclonable Functions and single-chip secure processor architectures.) says ‘security is a challenging problem, because it’s a negative goal’. Prefesor Devadas uses the example of accessing a .txt file. He gives us a myriad of ways that someone could attack another and discover the .txt, and he could keep going on and on. How do you know that you’ve thought of all the ways to stop an attack? You don’t, and that is why security is a challenging problem, because it’s a negative goal. There are three defensive strategies for IoT systems: prevention, resilience, and detection & recovery. This is where the complexity factor begins to nudge up a quite a few notches, like physical unclonable functions that correspond to protecting integrated circuits from physical attacks to extract secret keys that are stored in the integrated circuits. I had to read the transcript a number of times as the video lecture wasn’t enough to be able to understand the concepts in one sitting. In particular there was a section that was very mathematical and gave examples of the gen algorithm and the Learning Parity with Noise problem. Profesor Devadas uses an interesting analogy to describe the notion of computation under encryption. Let’s say Alice wants to buy a beautiful ring for herself. Not only that, she wants to design this ring. She is going to hire jewelry workers to create this ring for her and give them raw materials to do this. But there’s a problem here. The problem is one of theft. The jewelry workers could create the ring for her and just walk away with the ring. How could she protect against this scenario? Alice could create a locked glove box and put her raw materials inside the locked glove box. Alice puts the raw materials in a locked glove box. The jewelry workers are going to put their hands into the locked glove box, work on the raw materials, and create a ring, except that they have no idea that they’re even creating a ring. It’s only Alice that knows that they’re creating a ring for her. The jewelry workers, after they have finished their task, are going to take their hands out of the locked glove box and walk away. Alice willpresumably pay them for their work. But now Alice is going to be able to open up the locked glove box in private and take out her beautiful ring and enjoy it. Given this jewelry example, let me tell you exactly what happens from a mathematical standpoint. The analogy here is that encrypting is putting raw materials into the locked glove box. So the raw materials correspond to sensitive data that’s associated with Alice’s DNA, for example. Decrypting is taking things out of the box. As I mentioned, the jewelers have no idea that they’re building a ring. They simply produce an encrypted result in the mathematical domain. Alice is able to take the encrypted results and decrypt it to obtain her diagnosis. The computation is the process of assembling the jewelry, and this corresponds to computing on encrypted data. We need particular mathematical structures corresponding to the encryption and decryption algorithms to ensure that the computation on the encrypted data, to produce an encrypted result, produces exactly the same result as if Alice had computed on the original sensitive data using standard operations. The HCI and Robotics & Autonomous Vehicles lectures were an interesting history lesson on how both these technologies via Siri, Cortana, Alexa and Google’s driverless car etc are testament to the pace of technogical change. The future is much closer than we think. I think speech based interfaces for IOT is inevitable. Our devices are getting smaller. We want to talk to them all of the time. It’s just so natural for people. We’ve crossed that point in our society where speech is out there and people want more of it. And I think that’s what is going to happen. These interfaces are the future. They have to be untethered. They have to be robust to different environments, different contexts. They have to understand in larger context. Have to incorporate different modalities. Have to be multilingual. The types of things we see out there now coming out of the commercial market on smartphones and other devices is just the tip of the iceberg. Much more remains to be done. There’s lots of challenges, but the future is exciting. I want to see learning on steroids, lifelong learning where you can really think about the limit, as time goes to infinity, how does a system get better and better and learn more and more about the world? And ultimately this entails connecting to the cloud. When one robot learns a Coke can, every robot should know what a Coke can is. This notion of sharing information, things getting logged to the cloud. I have this notion of a robot that operates autonomously each day, capturing new experiences. And then at night when it goes back and connects to charge its batteries, there’s a sort of dreaming that happens overnight, of trying to makesense of all the data of that day and connect it to the data previously acquired by itself and other robots to try to build ever richer and deeper understandings of the world. This entry was posted in Uncategorized on May 13, 2016 by Nigel Barron. And this is where things (no pun intended) start to get complicated. There is the complexity of IoT networking options for example. Why can’t we just use the wireless technologies that we have for the internet, our cellphones to build IoT systems? Can’t we just use cylinder networks and Wi-Fi technologies? Why do we need something new? The answers aren’t immediately obvious but when you think about it cellular networks are limited by the battery life of, for example, your mobile devices (aka gateways) and are expensive. Wi-Fi networks are limited by their range, the fundamental problem of power consumption is why cellular and Wi-Fi technologies are not applicable to a wide range of IoT scenarios. Basically, IoT is about unusual events. Well, more specifically, data is at the core of those events. Consider applications in the space of infrastructure monitoring, like home monitoring, or monitoring pipes or other industrial equipment, or medical device monitoring. This is really about understanding when something interesting happens in these monitored devices. And the interesting thing that happens is fundamentally conveyed in data. For example, you might want to know that the temperature in your home went below some threshold, and the pipes are about to burst. Or with a medical patient, you might want to see some signal, like a brain or heart signal, that is showing some sort of anomalous value. Data starts from the sensors, it flows through the phones and base stations, and then ultimately ends up in a cloud-based infrastructure. Then there is the issue of missing and noisy data. These sensors, because they are sampling the real world, have periods of time that are not covered by the data itself. Also, the data that is coming from these sensors and these applications often has anomalies in it, things that are unusual or outliers. And so one of the real challenge is how do we detect and correct those kinds of outliers and anomalies? The classification-based method and frequent itemsets of course! Classification, for those of you like me who weren’t aware of it, is basically a way of giving outliers and anomalies a data set and dividing them into multiple classes. Frequent itemset mining basically compares the frequency of different sets of outliers to the frequency of the sets that occur in the inliers. What are the common things that occur in the outliers? In the frequent itemset mining world its about support. Support means detecting the elements that occur in one of set of data with more than some sort of frequency, ie more than two times. However, the most complicated part is localization. Devices will have to instantaneously localize themselves. They will have to have a sense of identity and they will have to have a sense of the surrounding world. How does a device compute its position and its heading in the world? Range-based localization and bearing-based localization of course! Unfortunately, this is where trigonometry and algorithms begin to play their part. I never thought I’d be uttering the words robust quadrilateral but that’s just the rabbit hole that this course is taking me down and I have to admit I’m thoroughly enjoying it. This week the Technologies module concludes with Security in IoT, HCI (Human Computer Interaction) in an IoT World and Robotics and Autonomous Vehicles. This entry was posted in Uncategorized on May 4, 2016 by Nigel Barron. ‘By 2020, there will be 50 billion devices connected to the Internet. How will you and your organization capitalize on this tremendous opportunity? The key lessons that our experience with the Internet teaches us about a future of things. A focus on network management, security, mobility and longevity. The desirable features of a distributed architecture for a system of things. As can you can see, MIT faculty leaders are at the forefront of the IoT space and are instructors on the course. Professors Sanjay Sarma, co-chair of the MIT Auto-ID Labs, Sir Tim Berners-Lee, inventor of the World Wide Web and founder of the World Wide Web Consortium (W3C) and David Clark, senior research scientist, MIT Computer Science and Artificial Intelligence Laboratory gave their lectures via a pre-taped video. Synchronized video transcripts and a compiled transcript of all course lectures are available to participants as well as PDF presentation slides. The videos are not available for download. Assessments are taken to reinforce key learning concepts presented in each module, short case studies and focused readings, discussion forums for participants to address thought-provoking questions posed by MIT faculty and a community Wiki for accessing additional resources, suggested readings, and related links all add to the online learning experience. There are also social networking groups on facebook and LinkedIn. I have to admit, however, that the MIT edx platform is a little basic. Discussion threads cannot be followed by latest comment, for example, which makes them hard to follow. Following other participants isn’t possible and the training admins seem a little overwhelmed by the amount of conversations taking place. Overall though, the course has been really interesting so far. I think Sir Tim summed the situation up very well in terms of the challenges and opportunities companies face. ‘So the Internet of things is a wave, which is coming, and it is going to be very valuable. And it will be much more valuable to the people and companies who have figured out how to use it in advance, who have made standards, who are prepared to cope with the massive diversity and different sorts of information about a given thing, companies who learned to link together things of very, very different types, and create meaningful information. Companies who’ve, from this diversity, managed to make a consistent view of what’s going on and have then designed things which will react to it in a timely fashion and produce the right actions. Next week the course moves on to technologies, specifically: Network Connectivity for IoT, Data Processing and Storage, and Localization. This entry was posted in Uncategorized on April 22, 2016 by Nigel Barron.